Completely armed, even down to the wrist, Deadshot wears gauntlets that hold an incredibly handy pair of guns. 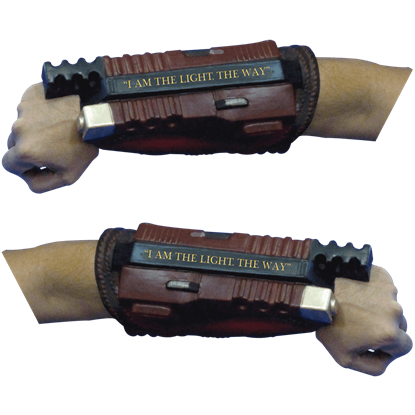 An officially licensed Suicide Squad costume accessory, the Adult Deadshot Costume Gauntlets feature molded details. Portrayed by Will Smith in the Suicide Squad movie, Deadshot is the leader of this unlikely group. 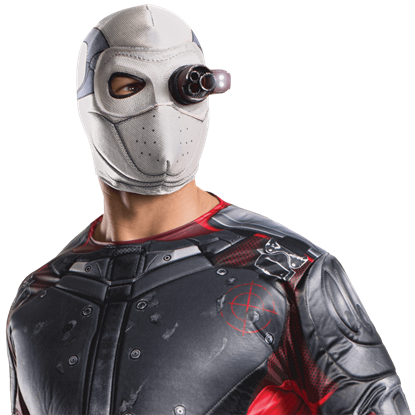 The Adult Deadshot Costume Kit is an easy way to get the appearance of this skilled marksman for your next costume-worthy event. When the time comes to take out his next mark, Deadshot dons his white mask and high-tech eyepiece. 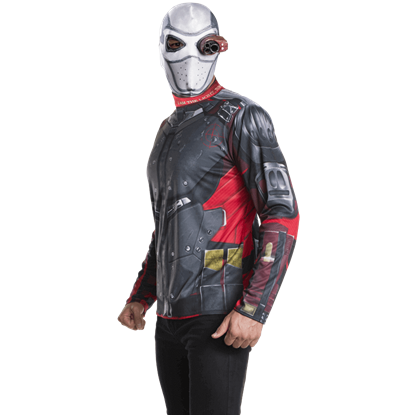 The Deadshot Fabric Mask is a licensed costume accessory based on the tactical headwear of Floyd Lawson from Suicide Squad. With his cybernetic eye scope at the ready, Deadshot prepares to hit his mark. 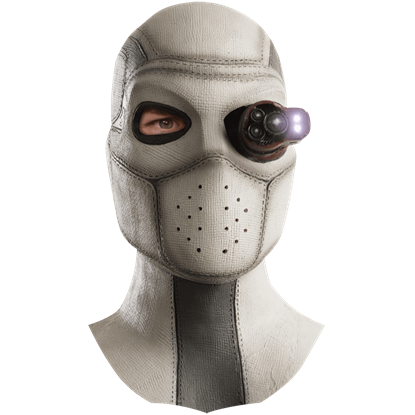 The Adult Deadshot Light-Up Fabric Mask is based on his Suicide Squad movie appearance, where he leads a misfit band of villains on a dangerous mission. With a high-tech eyepiece that boosts his already uncanny accuracy, Deadshot is one of the most skilled marksmen in the DC Universe. The Adult Deadshot Light-Up Latex Mask depicts his deadly look from the Suicide Squad movie. 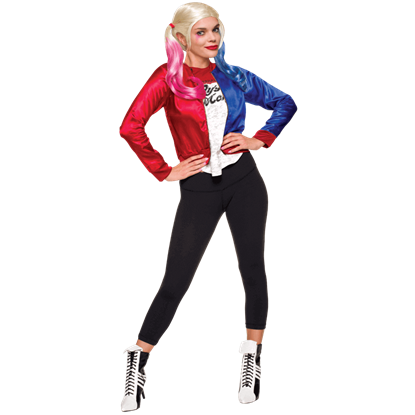 Based on her Suicide Squad movie appearance, the Adult Harley Quinn Costume Jacket with Shirt is an easy way to dress as this supervillainness at your next superhero-themed event, costume party, convention, or Halloween celebration. Whether he lost his old ones in a scuffle with Batman or ate too much candy, Suicide Squads Joker sports a row of metallic choppers. 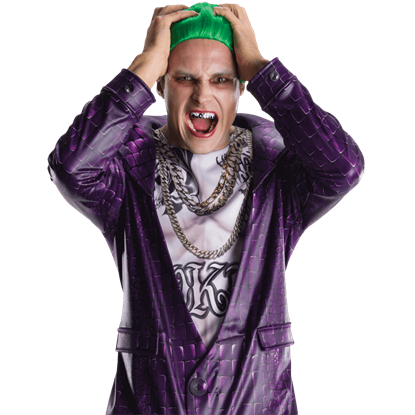 Wear the officially licensed Adult Joker Costume Teeth to be sure your look includes this detail. 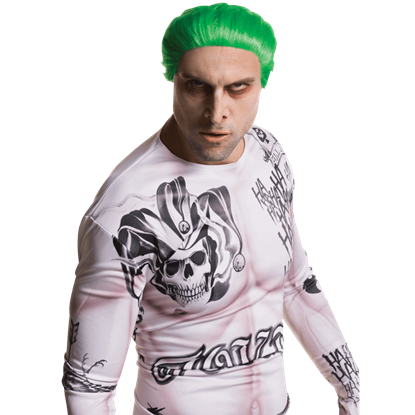 With its brilliant green hue in a short, smoothed back style, the officially licensed Adult Joker Wig displays the eye-catching hairstyle of this maniacal DC Universe supervillain as he appeared in the 2016 Suicide Squad movie. 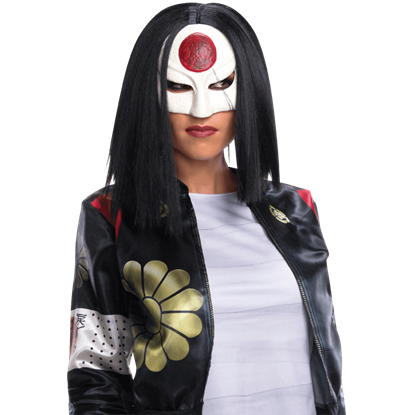 A volunteer member of the Suicide Squad, Tatsu Yamashiro is better known as the superheroine Katana. Fans can now get the Suicide Squad look of this expert swordswoman and martial artist with the Adult Katana Costume Kit. Wielding her Soultaker blade, Katana volunteers to assist the Suicide Squad in the 2016 film. A licensed costume accessory, the Adult Katana Wig is perfect for getting the look of this skilled swordswoman and martial artist. In the 2016 Suicide Squad movie, Harley Quinn is portrayed by Margot Robbie dressed in bright red and blue color blocked patterns. 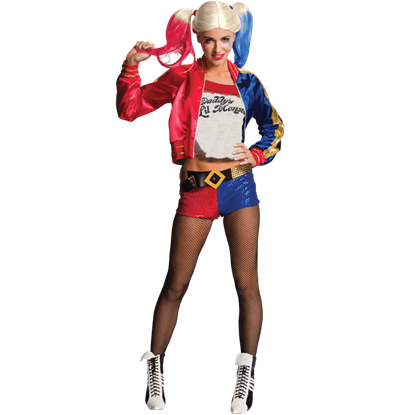 The Adult Suicide Squad Harley Quinn Costume depicts her outfit with fantastic, eye-catching details. In Suicide Squad, Harley Quinn deviates from her traditional harlequin look in exchange for a trendier, brightly colored approach. 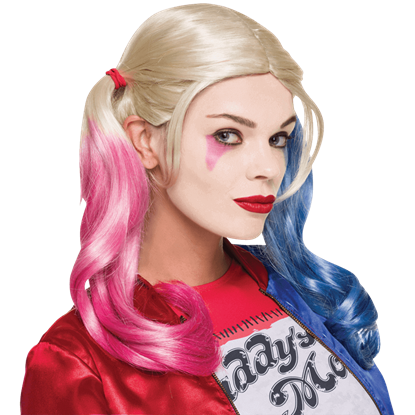 The Adult Suicide Squad Harley Quinn Wig displays her blonde, dip dyed pigtails from the 2016 film.